A PROFESSOR has decided to go out with a bang – by paying to have his ashes turned into a giant firework. Professor Joe Goldblatt has already decided to donate his body to medical science. But the Texan-born academic has decided to go a step further by having his mortal remains blasted across the skies of Edinburgh. Prof Goldblatt, executive director of the International Centre for the Study of Planned Events at Queen Margaret University, says he plans to turn his death into the “ultimate event”. He has organised for what the medical students leave to be ­cremated and placed in a 12 in pyrotechnic shell. The academic, originally from Dallas, has charged his two sons with the job of sending him out in style as the final explosion in a funeral fireworks display. 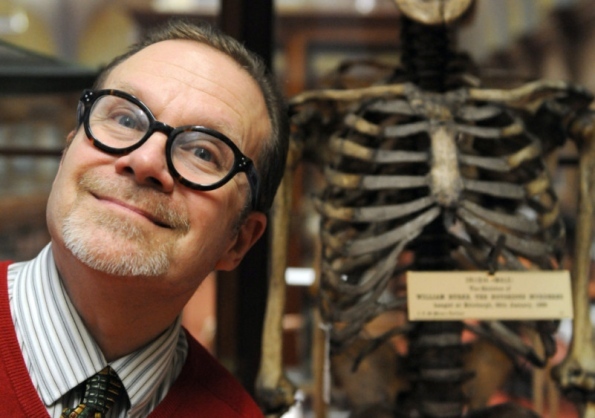 Prof Goldblatt has donated his body to the University of Edinburgh’s Anatomy Department. The 60-year-old, who has arranged functions for US presidents Ronald Regan and George W Bush and tycoon Donald Trump, claims that his wife, Nancy, and sons have been fully supportive of his decision. He said: “The reaction has been 100 per cent positive about me donating my body. The only feedback has been in the form of questions over what happens about a funeral and with my ­remains. Prof Goldblatt said that a portion of ashes would go to mausoleum in New Orleans and the rest kept in Scotland to be “placed in a 12 in pyrotechnic shell and turned into a firework”. Fellow American Hunter S Thompson appears to have started the trend for pyrotechnic funerals. In 2005, the gonzo journalist’s ashes were loaded into a huge cannon and set off over his home in Aspen, Colorado, in an event paid for by actor Johnny Depp. Actor James Doohan, who played engineer “Scotty” in Star Trek, went a step further by having his ashes blasted into orbit on board a rocket in May last year. Prof Goldblatt said he was inspired to donate his body to science by his mother, Rosa, who gifted her body to the Baylor Medical School in Texas when she died in 1997. Edinburgh University’s Anatomy Department is one of the country’s leading medical centres and is currently given around 50 bodies a year which are used to train medical ­students.